It is referred to in different ways, depending on where you are from … in Hilo it’s Ice Shave; lots of folks outside the Islands call it Sno-Balls, SnoCones (or Snow Cones) or even Shaved Ice … most, here, call it Shave Ice. In 1956, five years after Matsumoto Grocery Store first opened their doors to the public, a family friend suggested that the store sell cones of shave ice to help make up for slow business. Born in Hawaiʻi, Mamoru Matsumoto’s family returned to Hiroshima-ken when he was a toddler, and they struggled to survive. He worked as an apprentice at a sake factory and other odd jobs, but the income was insufficient. Through friends and relatives he met his wife, Helen Momoyo Ogi, and they were married at the Haleiwa Jodo Mission. Mamoru worked long hours while Helen became a seamstress. They dreamed of opening their own business and purchasing a home for his family in Japan and for themselves. This was before the present big wave surfing on the North Shore. Until the 1930s, modern surfing in Hawaiʻi was focused at Waikīkī; there the waves were smaller. Then, in 1937, Wally Froiseth and John Kelly, reportedly on a school trip witnessed the large break at Mākaha and later surfed its waves. They were later joined by George Downing and others. Riding at an angle to the wave, rather than the straight to shore technique, on the new “hot curl” board, with narrower tails and V-hulled boards, allowed them to ride in a sharper angle than anyone else. Mākaha became the birthplace of big wave surfing. Even before Oʻahu’s North Shore, Mākaha was ‘the’ place for surfing – especially big-wave surfing. But North Shore surfing caught on, so did the requisite stop at Matsumoto’s for shave ice. Kamehameha Schools recent redeveloped the area. In all, the 28,000-square-foot retail complex spans a 0.1-mile section of Kamehameha Highway between Mahaulu Lane and Kewalo Lane. The date of construction of the Haleiwa airfield has not been determined. The earliest depiction of the field which has been located was a 1933 aerial photo, which depicted a group of B-6A biplanes on a grass field. Haleiwa Field on the northwest coast of Oahu, 30-miles from Honolulu, was originally (prewar) a center for private flying. Originally used as an emergency landing field, it had only an unpaved landing strip. Those on temporary duty there had to bring their own tents & equipment. On December 7, 1941, combined forces of the Japanese Imperial Navy struck at Naval and Army installations on Oahu – and the secondary target was the fleet of American aircraft scattered about the island, aircraft that could disrupt the aerial assault and then follow the fleeing Japanese back to their carriers. The first targets hit were the airfields: Wheeler, Kaneohe, Ewa, Hickam, Ford Island, Bellows and the civilian airport serving Honolulu. In the strafing and bombing, scores of American aircraft were destroyed in a few minutes. The Imperial bombers could then concentrate on the American fleet at Pearl Harbor. Haleiwa Field earned its place in history when it became the only airfield able to provide defense against the sneak attack on Pearl Harbor. The Japanese heavily strafed the aircraft at Wheeler Field and few aircraft were able to get airborne to fend them off. Haleiwa was an auxiliary field to Wheeler and contained a collection of aircraft temporarily assigned to the field including aircraft from the 47th Pursuit Squadron. A total of eight Curtiss P-40 Kitty Hawk and 2 Curtiss P-36 Mohawk pursuit planes were at the field on the morning of 7 December 1941. Lt. George S. Welch (heir to the grape juice family) and 2nd Lt. Kenneth M. Taylor (on his first assignment,) both P-40 pilots, were at Wheeler when the attack began. They had previously flown their P-40B fighters over to the small airfield at Haleiwa as part of a plan to disperse the squadron’s planes away from Wheeler. Not waiting for instructions the pilots called ahead to Haleiwa and had both their fighters fueled, armed and warmed up. Both men raced in their cars to Haleiwa Field completing the 16-mile trip in about 15 minutes. With their P-40s, now warmed up and ready, they jumped into their cockpits. The crew chiefs informed them that they should disperse their planes. “The hell with that”, said Welch. Ignoring the usual pre-takeoff checklists the aircraft took off down the narrow airstrip. The two P-40s engaged the aircraft attacking Ewa Mooring Mast and shot down five Japanese planes. They then returned to Wheeler to replenish their ammunition. While there, another wave of dive bombers appeared and Lt. Taylor raced back into the air. His P-40’s cockpit was damaged as a Japanese plane chased him. Lt. Welch was able to down the plane following him and they both returned back to Wheeler. Lt. Welch was credited with a total of four Japanese planes shot down and Lt. Taylor downed two. The Army improved the field during the early part of World War II and it was in use to simulate real battle conditions for gunnery training. In 1944 the Navy took the field over for carrier-landing training. After the war Haleiwa Fighter Strip was apparently reused as a civilian airport for some period of time. Haleiwa was depicted as a civilian airport on the 1947 Hawaiian Islands Sectional Chart. with A-24 and 2 PQ-8A target aircraft. 4 Bell P-39s fly over Haleiwa Field as maintenance work progresses at left. “I knew the wooden images of deities, carved by our own hands, could not supply our wants, but worshiped them because it was a custom of our fathers. 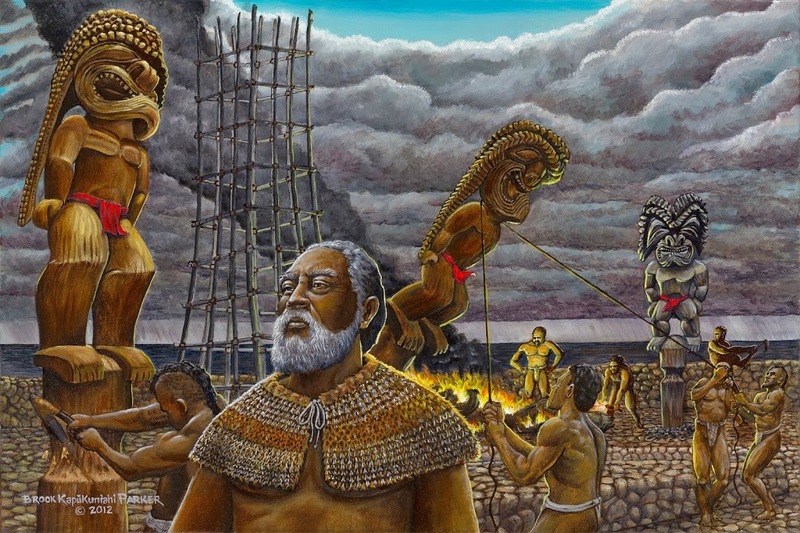 My thoughts has always been, there is only one great God, dwelling in the heavens.” Hewahewa also prophesied that a new God was coming and he went to Kawaihae to wait for the new God, at the very spot were the missionaries first landed. This changed the course of the civilization and ended the kapu system, and effectively weakened the belief in the power of the gods and the inevitability of divine punishment for those who opposed them. At Kailua, Hewahewa gave an even more astounding prophecy, he pointed to a rock on the shore and said to the new king, ‘O king, here the true God will come.’ When the missionaries arrived at Kailua, they landed their skiff on that very rock! This rock is commonly known as the ‘Plymouth Rock of Hawaiʻi. Education in the US at the beginning of the 19th-century was primarily triggered by the need to train the people to help grow the relatively new nation. Western-style education did not begin in Hawai’i until after members of the American Board of Commissioners for Foreign Missions (ABCFM) arrived in 1820. In 1835, at the general meeting of the Mission, a resolution was passed to promote boarding schools for Hawaiians; several male boarding schools and two female boarding schools were begun (Wailuku Female Seminary on the island of Maui and the Hilo School for Girls on the island of Hawai’i.) Before the 1850s, both of these schools had closed. Wailuku Female Seminary (or the Central Female Seminary, as it was first called) was the first female school begun by the missionaries. It received support at a time when the missionaries were experimenting with both boarding schools and a manual labor system. Due to the isolated location of the seminary, it was difficult to attract many students to the school. As a consequence, tuition and board were free, as long as the girls were placed under the parental care of the teachers of the school until the girls were married or obtained employment. In 1865, after struggling to fill the school, it was decided to move the school to Waialua, Oʻahu, on the Anahulu Stream. It opened there on August 7 with 50-students, ranging in age from 11 to 15. As with other schools at the time, the students were instructed in the Hawaiian language. The girls at Waialua Female Seminary came from families where the traditional Hawaiian culture was still practiced. However, at school the girls were dressed in calico, as opposed to their usual holoku; they slept in beds, rather than on mats on the floor; and they ate at a table with silverware, instead of on the floor using their fingers. The older girls put the food away, washed the dishes and swept the floor. The younger girls did various tasks, which included sweeping and dusting the parlor, the sitting-room or the schoolroom, gathering up the litter of leaves and branches from the yard and garden paths, or putting the teachers’ rooms in order. Some of the girls were involved with preparing the meals; all the girls washed and ironed clothes once a week. The academic work took place between 9 am and noon and 1 pm and 4 pm. The curriculum included geography, arithmetic, surveying, astronomy, singing, Bible history and the Bible in general. Manual training consisted of instruction in cutting and sewing dresses, in washing, ironing, cooking, cleaning house and painting; an hour and a half was spent on gardening and farming. The school was called ‘Hale Iwa’ by the girls (the first use of the name for this area.) Later, that name came back to this area when OR&L opened the Haleiwa Hotel (1899;) when the hotel closed (1943,) the name of the area remained as Haleiwa, and it continues to be called that today. 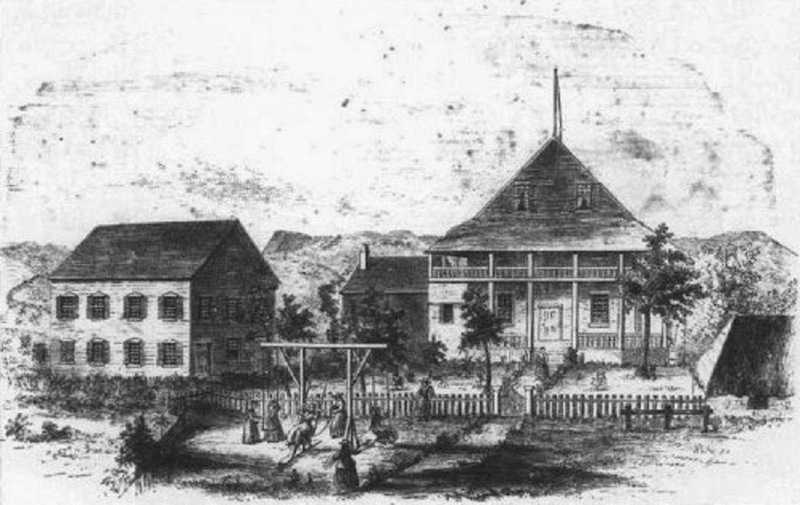 The image shows Waialua Female Seminary (1865.) In addition, I have added other images in a folder of like name in the Photos section on my Facebook and Google+ pages. The queen was fond of the congregation – which once numbered in the thousands, according to church records – and donated hymnals, cut-glass chandeliers and a seven-dial, universal-calendar clock. The church was renamed for Liliʻuokalani in 1975. Over the course of a little over 40-years (1820-1863) (the “Missionary Period”,) about 180-men and women in twelve Companies served in Hawaiʻi to carry out the mission of the American Board of Commissioners for Foreign Missions (ABCFM) in the Hawaiian Islands. “You are to aim at nothing short of covering these islands with fruitful fields, and pleasant dwellings and schools and churches, and of Christian civilization.” (The Friend) Reverend John S Emerson and his new bride Ursula Sophia Newell Emerson were part of the Fifth Company of missionaries. Emerson was born December 28, 1800 in Chester, New Hampshire; he descended from a branch of the Emerson family emigrating from England and settling in Haverhill, Massachusetts, in 1652. Emerson left home at the age of 15 and started his studies preparing for college, and subsequently graduated from Dartmouth College, Hanover, New Hampshire, in 1826. After graduating, like so many of the Alumni of American colleges, he became a teacher before entering upon his theological studies. These were pursued for three years at Andover, where he graduated in 1830. He anticipated becoming a missionary in India, but, yielded to a special call from the Sandwich Islands. He married Ursula on October 25, 1831 in the old parsonage of Nelson, among the New Hampshire hills, where her father, Rev. Gad Newell, was the pastor from 1794 to 1859. They left for the Islands a month after their wedding (November 20, 1831) and spent almost six months on board ship – arriving in the Islands May 17, 1832. “Very soon after his arrival the ‘general meeting’ of the Mission assigned Mr and Mrs Emerson, to the station of Waialua, on Oʻahu.” (The Friend, April 1867) Waialua stretched along the coast for 30-miles with a population of 8,000. They sailed from Honolulu on a small schooner to get there. The government selected a spot for a second church to replace the first one. An adobe building, about 100-feet by about 50-feet was built around 1840-1841 on what is now the cemetery area of the present church property. Emerson served the Church until 1842 when he took a position as professor at the Lahainaluna Seminary on Maui, and also served as pastor of the Church at Kāʻanapali. He published five volumes of elementary works, three of them in the Hawaiian language, and, while at Lahainaluna, was joint author, with Rev. Artemas Bishop, of an “English Hawaiian Dictionary,” based on Webster’s abridgment (Lahainaluna, 1845.) He later returned to Waialua and served the congregation until 1846. 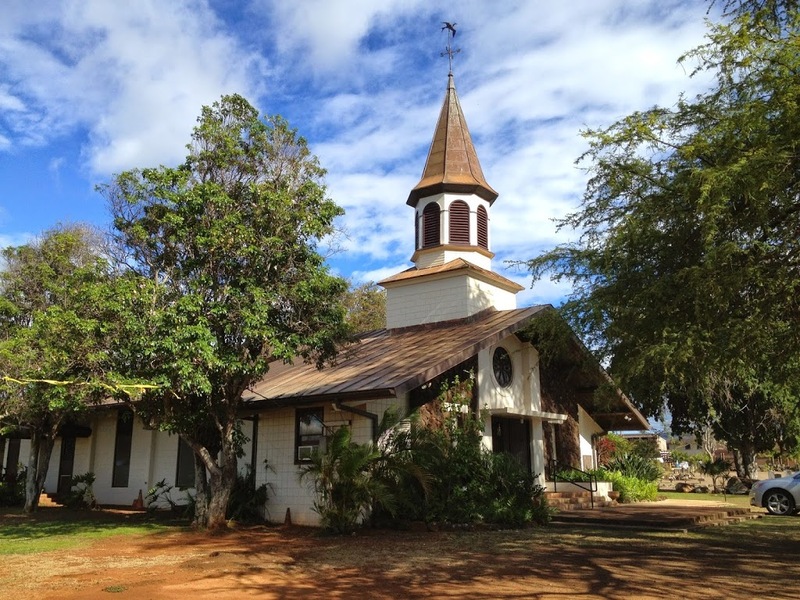 A third church was built of wood in 1890 on the present location and it was this building that Queen Liliʻuokalani worshipped in when she stayed at her beach home along the banks of the Anahulu River. The image shows the Liliʻuokalani Church in Haleiwa. In addition, I have added others similar images in a folder of like name in the Photos section on my Facebook and Google+ pages.